Choosing the right size bike is essential for safety, comfort and ease of use. If you can get to our shop then great, we can bike fit you by taking measurements, using smart software and a lot of our experience. If you can’t get to us and you’d like your bike to be delivered to you, we have come up with a chart using data from our brands and bike fitting software that you can use to find the right size frame. 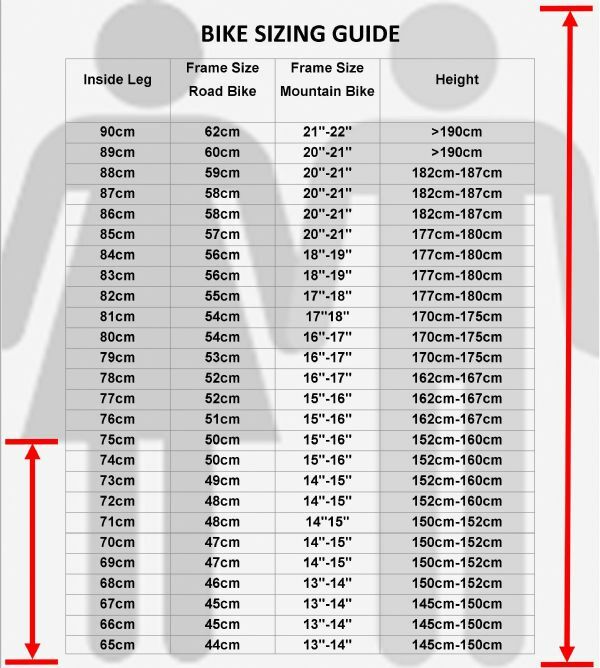 If you are an experienced cyclist, then you may just want to refer to the geometry chart for the bike which should be on every bike product page. Height - You will first need to measure your height. Please do this with your shoes off, standing with your back against a wall and feet together, it works best with someone helping you. Get someone to mark with a pencil on the wall where the top of your head comes to. Measure from the floor to the mark. Inside Leg - Next you need to measure your inside leg. Again, stand with your shoes off, feet together, back against a wall and make a mark with a pencil on the wall as high as you can rest the pencil horizontally between your legs before becoming uncomfortable. Then measure from the floor to the mark. If you are between sizes or unsure of how to correctly identify which frame size is best for you then please contact us on 01787 379406 and one of our experts will be happy to advise you. Please have your height and inside leg measurement ready for us. Equally when your desired bike is being built and checked for you by one of our experienced technicians, they will check the measurements you have provided to ensure you are getting the right size bike.